The Contemporary Arts Center celebrated its 40th Anniversary Season. 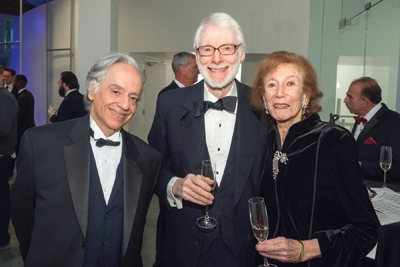 The Contemporary Arts Center held a black-tie birthday party in honor of its 40th Anniversary Season. Prior to the Gala, the Patron and Honorees Party took place at the art-filled Uptown home of CAC Trustee Valerie Besthoff. The following week, the SweetArts 2017 gala brought patrons to the Contemporary Arts Center, adorned in modern, elegant décor for the fête. “SweetArts” Honorees were: Jolene Pinder for Arts Educator/Community Partner; Junebug Productions for Performing Arts; Corporate Realty for Philanthropist; and Tina Girouard, Gene Koss, Martin Payton and Mario Villa for Visual Arts. CAC Director and CEO Neil A. Barclay raised a toast to the milestone birthday, to the honorees and the founders and friends who have supported the CAC over the years. The toast included a presentation of cupcakes with sparklers by Trixie Minx Production's burlesque performers, and the Committee Chairs launched confetti canons into the crowd. The evening included a Blind Bid Art Auction with works from 23 local artists, custom on-the-spot poems written on a typewriter by Cubs the Poet, a festive birthday-themed photo booth, tarot card readers, Magnolia Makeup glitter lip station and a place to write birthday wishes to the CAC. A selection of drinks, passed hors d’oeuvres and small bites were provided by a host of local restaurants and beverage purveyors. T-Ray the Violinist played electric violin in the CAC’s Atrium during cocktail hour. Brice Miller and Twisted Dixie played New Orleans-inspired modern tunes and oldies to start the gala, and DJ Riviera Slim (Ron Rona) kept the late-night party going with popular hits that packed the dance floor.